To start the new year right, let's put to bed the 'Is Jack Daniel's bourbon?' argument once and for all. Jack Daniel’s is not bourbon. That is the correct answer. Although it is made almost exactly like bourbon, and pretty much tastes like bourbon, Jack Daniel’s is a little bit different so its makers prefer to call it Tennessee whiskey. That is all true; undisputed, in fact. It only gets murky when people try to guess why Jack Daniel’s is not called bourbon. They usually assume it cannot be called bourbon. They further assume that the pre-barrel charcoal leaching process that makes Jack Daniel’s a little bit different is prohibited in the rules that govern bourbon production. The assumption that the so-called ‘Lincoln County Process’ prevents Jack Daniel’s from being called bourbon isn’t just wrong, it is perfectly wrong. Jack Daniel’s doesn’t want to be bourbon, not now, not ever. To its makers and legion of fans, Jack Daniel’s is everything bourbon is and more. ‘The Lincoln County Process’ is the extra step that makes Jack Daniel’s better than bourbon, so they say. The makers of Jack Daniel's have believed this back to and including Jack himself. Many years ago, the company took steps to prevent the Federal government from forcing them to call their whiskey ‘bourbon.’ That is why some people insist that Jack Daniel’s is bourbon, because it meets every legal requirement. ‘Bourbon in all but name’ is another way of saying it. The false belief that Jack Daniel’s cannot be called bourbon leads to the equally false belief that Jack Daniel’s is an inherently inferior product. You may not like Jack Daniel’s, either just Old No. 7 or all of the expressions, but you can’t blame that on its lack of bourbon-ness. The Jack Daniel’s production process is as rigorous as that of any bourbon maker, and it checks every box in the bourbon rules. No one can argue with the brand’s success. Jack Daniel’s is the best-selling ‘bourbon-style’ whiskey in the world. So why isn't Jack Daniel's called bourbon? The answer goes back to the Repeal of Prohibition in 1933. When the American distilling business restarted, new rules were put in place. They defined different types of distilled spirits in great detail and required producers to use the type classifications that most closely described their products. If your whiskey met the standards for bourbon you had to call it bourbon. At least, that seemed to be the rule. This was a problem for Tennessee’s Motlow family, makers of Jack Daniel’s Tennessee Whiskey, but it was not their most immediate concern. Tennessee did not repeal its state Prohibition laws in 1933 with the rest of the country. This prevented Jack Daniel’s from resuming operations. Distilling didn’t become legal in Tennessee until 1937. 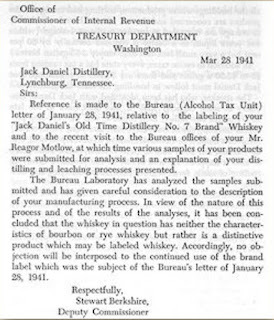 When Jack Daniel’s started up again, they made some products they could sell right away, such as brandy and unaged corn whiskey, but they knew the Jack Daniel’s Tennessee Whiskey they were making would not need label approval until about 1941, because it would take that long for the first batch to fully age. When they eventually did submit their label for approval, they did not use the bourbon classification. That began a series of negotiations between the government and Lem Motlow’s son, Reagor. The family had never called their whiskey bourbon before and they didn’t intend to start now. “Jack Daniel’s was told by the government that they had to call it a Bourbon,” explained a Jack Daniel’s spokesperson. “We objected and used the fact that our whiskey is different and ‘doesn’t have the characteristics of a bourbon.’” Reagor Motlow made several trips to the government office in Louisville to argue his case. Tests were conducted in the government laboratory there. 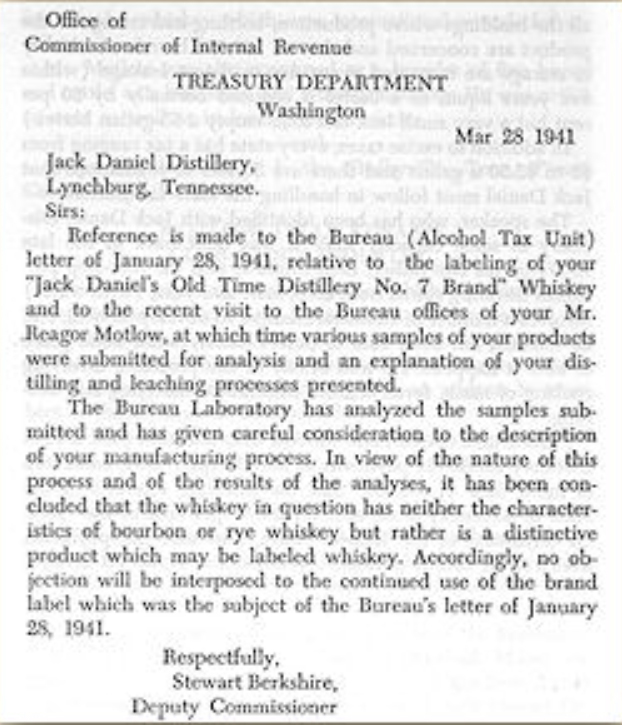 In the end, the government concluded that Jack Daniel’s Tennessee Whiskey had “neither the characteristics of bourbon or rye whiskey but rather is a distinctive product which may be labeled whiskey.” The decision was spelled out in an official letter withdrawing the agency’s earlier objections to the label as proposed. Reagor would have preferred the creation of a ‘Tennessee whiskey’ classification, but he took what he could get. Years later, the Schenley Company tried to buy Jack Daniel’s but Brown-Forman got it instead, so Schenley decided to revive the George Dickel brand as a Tennessee whiskey to compete with Jack Daniel’s. They built a distillery in Tennessee and embraced pre-barrel charcoal leaching as a Tennessee thing. ‘Tennessee whiskey’ is still not recognized as a classification in the Federal code, but the Tennessee legislature has enshrined a definition in Tennessee law. This is pretty much the entire and correct explanation for why Jack Daniel’s is not a bourbon, yet it seems unlikely to end the arguments. Probably that’s the whiskey talking. Great article, Chuck. Love the image of those guys in the bar. Nah. I'll take it. After that explanation, I'll jump into the not-a-bourbon crowd. While I disagree with it not having the general characteristics of bourbon, the government and the Motlow family have spoken. And if they agree it's not bourbon, who am I to disagree? The question is more existential than you may imagine. What is bourbon, really? You have the facts. What do you think? Chuck - I believe you have been hoodwinked. The CFR requires that the distillers "must" not "may" submit a formula if their process alters a distilled spirit from its original class. I.e. JD was required to submit a formula due to either their distillation or leaching/filtration process which apparently changed the class for Bourbon, to something else. The "else" was Whiskey. Thereafter they "invented" the term Tenesee Whiskey just to make themselves and their process seem special (vs what they are really doing, filtering well over 15% of the oils and flavor out, to make their product smoother). Your anaylisis is typical, as JD wants people to believe, but again it totally misses the fact that they were and are required to have a formula "only becuase their process changed the class". You aren't allowed to even ask for a formula if your process complies with a standard class. So all the smoke and mirrors is just that. A cover story for their process which strips a significant amount of flavor from their distillate prior to aging . I became a Tennessee Squire (deed number withheld by Royal Censor) in the mid-1970s after a Brown-Forman rep found out I drank JD exclusively when I was drinking neat or with ice (Evan Williams was my bourbon mixer). I liked JD Black better than the few other whiskies I'd tried neat or with ice - most of which were snuck from my Dad's liquor cabinet, and he was an Old Crow with Diet Coke guy. I remained faithful until 1987 when the proof of JD Black Label dropped from 90 to 86. My palate began wandering. When it hit 80 in 2002, I felt betrayed, and the divorce became final. Recently, the B-F/JD barrel strength releases and the B-F/JD Rye brought me back although I confess I am no longer monogamous RE: American whiskey. Now that I am much older, the bourbon/not bourbon conundrum is "fun" but no longer determinative of what I drink. Rather, TASTE is the sole determinative. Call it a rose, dog food, brourbon, or even the "UN-bourbon" - I don't care anymore; but I do like that JD Barrel Strength with a measured amount of water to take it down to about 94 proof. Just saying. IN SUM - great information, Sir. I particularly liked the letter. To follow up on my 6:06 post, I am not demeaning JD in any way, it's a god product brought about by a decent process. If you think about why it all came about, it was clearly bacause they were trying to bring decent product to market, soon after prohibition repeal. The best way to do that (make a smooth product in a short time that still tastes like burbon) was to use a bourbon mash bill, bourbon distillation proof, and new charred oak. It's the pre-filtration that makes the difference. Many of us do it, just without the drama and hype. Hi Chuck. Do you know, or can find out, in what year the 27 CFR 5.22 "Standards Of Identity" came into effect, or at least the version of it that includes the US government's current definition of bourbon? Second, is it a safe assumption that the 1941 letter you refer to was written before the current definition of bourbon was enshrined in law? I know the part about bourbon having to be made in the US didn't come along until the 1960's, so at least in one respect the legal definition has changed since 1941. The position I hold -- call me right or call me wrong -- is that the US government gets to define what bourbon is, and as far as I can determine, "Tennessee Whiskey" is made in a way that conforms to the US government definition, with the Lincoln County process not incompatible with bourbon production because it is a subtractive process and the TTB only prohibits additives from being put in bourbon. If Jack Daniel's does not want to call their bourbon "bourbon" that is fine with me as long as the US government is content to classify Tennessee Whiskey as bourbon (as you have previously pointed out they do) and not force JD to actually use the word "bourbon" on their labels. A couple of years ago Woodford Reserve distillery issued a statement saying that "bourbon" can only be made in Kentucky and in no other American state, something which I point out here just to prove that distillers can believe things that are simply not true, displaying either ignorance or perhaps a political position that refuses to acknowledge that the US government has the authority to regulate in these matters. 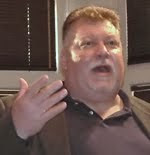 Richard, sorry but : "process not incompatible with bourbon production because it is a subtractive process and the TTB only prohibits additives from being put in bourbon " is totally incorrect. re CFR alterations of class and type :(b) Extractions. The removal from any distilled spirits of any constituents to such an extent that the product does not possess the taste, aroma, and characteristics generally attributed to that class or type of distilled spirits alters the class and type thereof, and the product shall be appropriately redesignated. In addition, in the case of straight whisky the removal of more than 15 percent of the fixed acids, or volatile acids, or esters, or soluble solids, or higher alcohols, or more than 25 percent of the soluble color, shall be deemed to alter the class or type thereof. This is exactally what JD does. And as such it CAN NOT be labeled as Bourbon. If JD contains caramel coloring that would also end the argument. Is anyone claiming that they do or do not? That always seemed an 'easier' answer, if it's testable. Camper, JD does not contain caramel coloring nor any other additives. Anonymous offers some sound analysis of the regs. Only problem is, there is no evidence that any of that actually happened. It is pure speculation. They can call it what they want. Seems to be the big fad these days. Today I identify as a TN Whiskey. OK fine. I go by taste and don't touch the stuff. Although I will admit the single barrel offering isn't too bad. At least when I tried some after a few real bourbons. . .
Chuck - If you read my upper posts about the CFR's plus the letter you included from the Treasury, there is incontrovertible evidence that this all happened. I.e the very fact that the document exists, clearly indicates that this all happened, let alone the fact that they needed to submit the formula for COLA approval to begin with. Jeez... that's the beauty of the system. It allows people to know what they are buying. If everybody tries to then pretend that the product is something else, you might as well scrap the entire process. The next thing you know we will be drinking Tito's MGP/NGS Whiskey. Wow! Thanks for this super informative article! I love Jack Daniel’s Fire, myself. I’m glad we can get it here in France. Myself, I have to wonder if the "lab tests" involved greasing of palms. I don't like the flavor of any JD expressions I've tried (No. 7, Gentleman, Single Barrel) but it's an important historic distiller and brand with plenty of customers. They should be able to call their hooch whatever they want so if they did grease palms, I can't blame them. It's not really a bribe as it does not pervert justice, more like restores it. I just checked the bottles on my shelf - No. 7, Gentleman Jack and Single Barrel. None of them say "straight" whiskey. Why not?